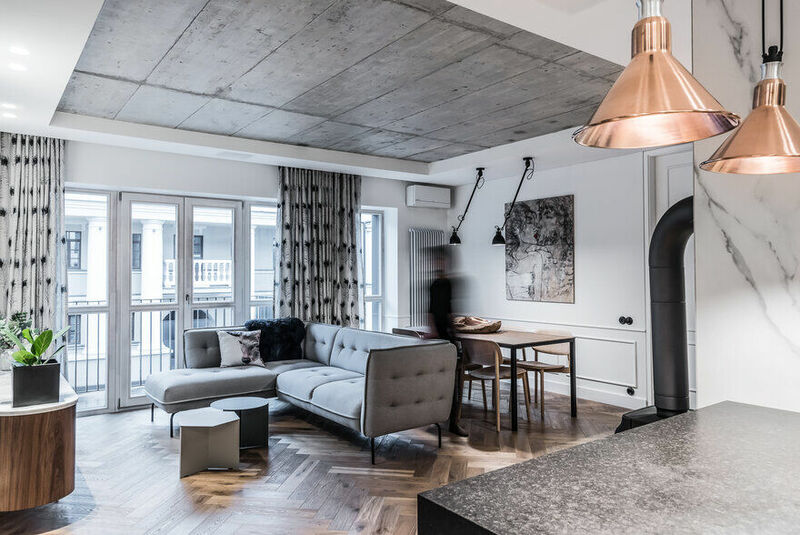 Description by architect: One of the challenges for many cities and metropoles is to keep the young families in town and to limit the exodus towards the suburbs. 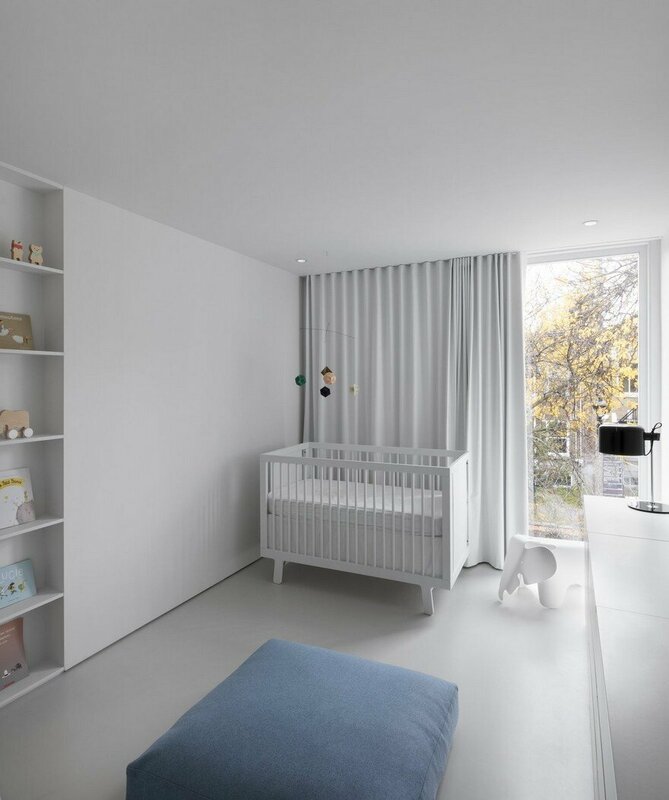 To convince them, many strategies are being set up such as an adaptive urbanism, efficient transportation offer, local services and commerces, … Among those challenges, the housing for young families remains an issue. 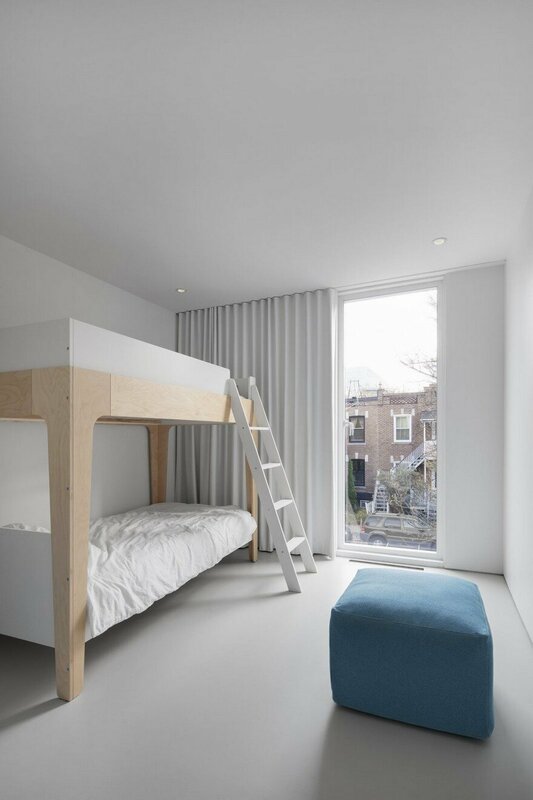 How to offer enough space, privacy and security in global urban housing strategy, keeping a high density of population? 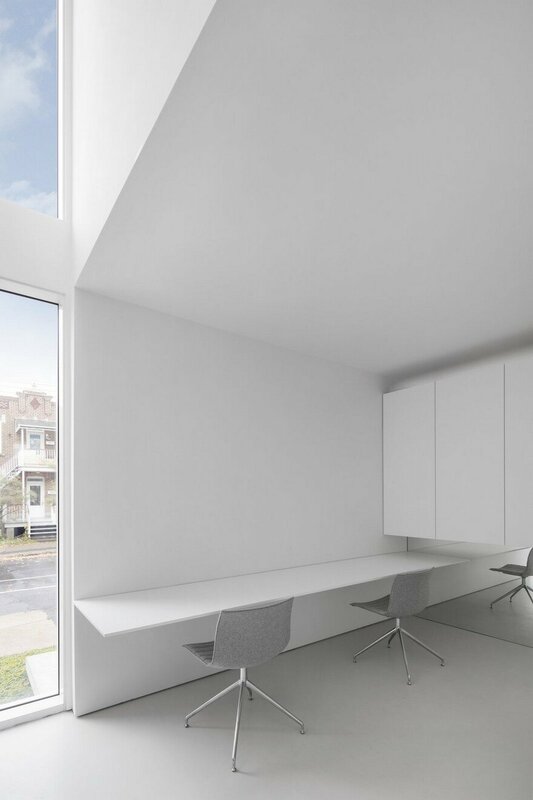 Common single-family homes found in urban environment are often in lack of natural light, especially on the ground floor, or deprived of intimacy. 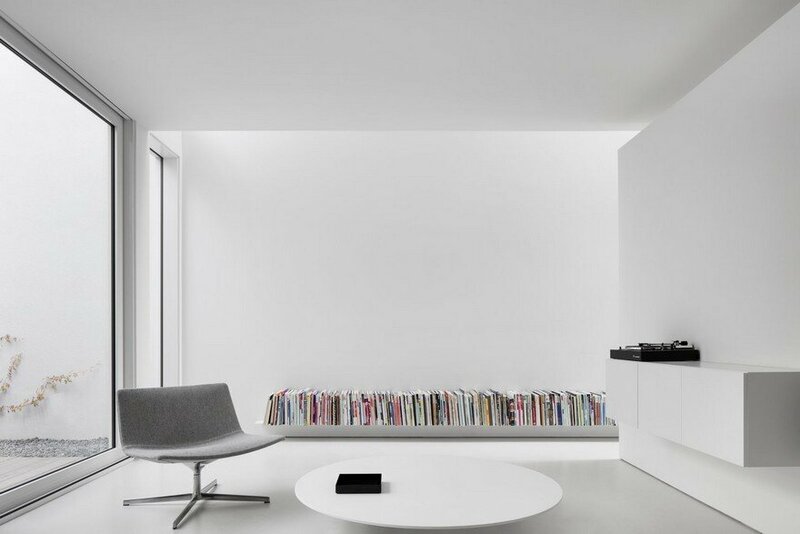 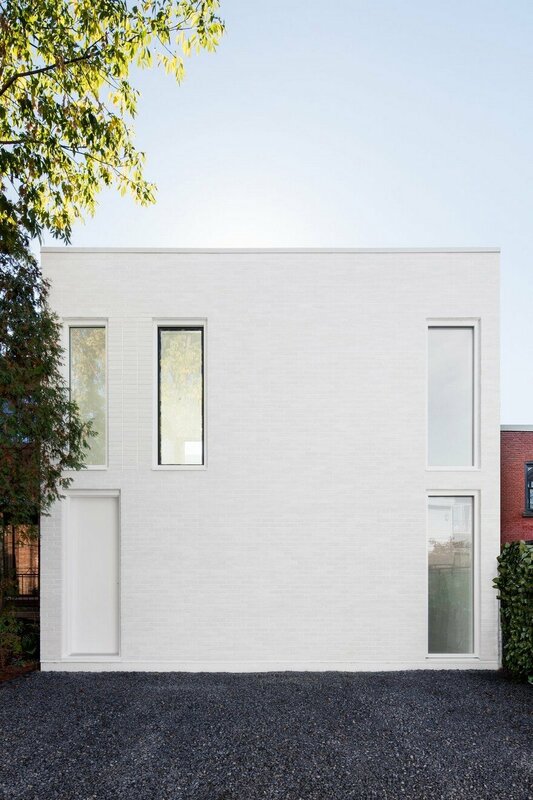 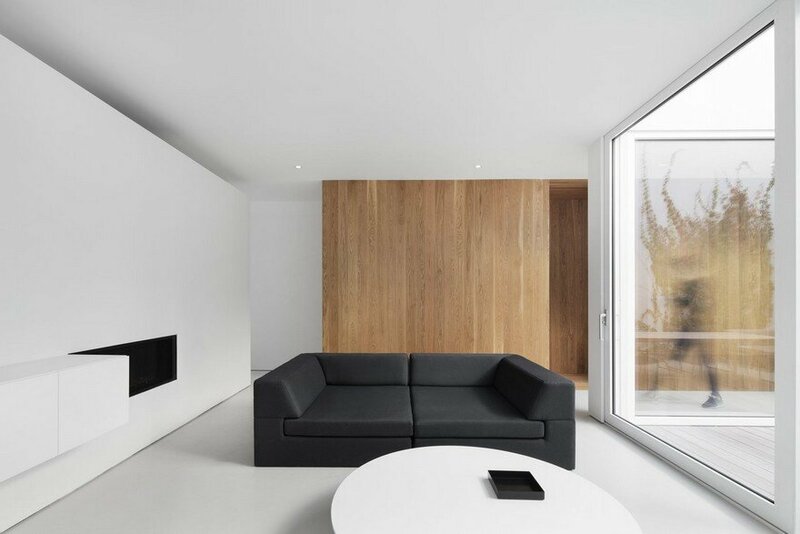 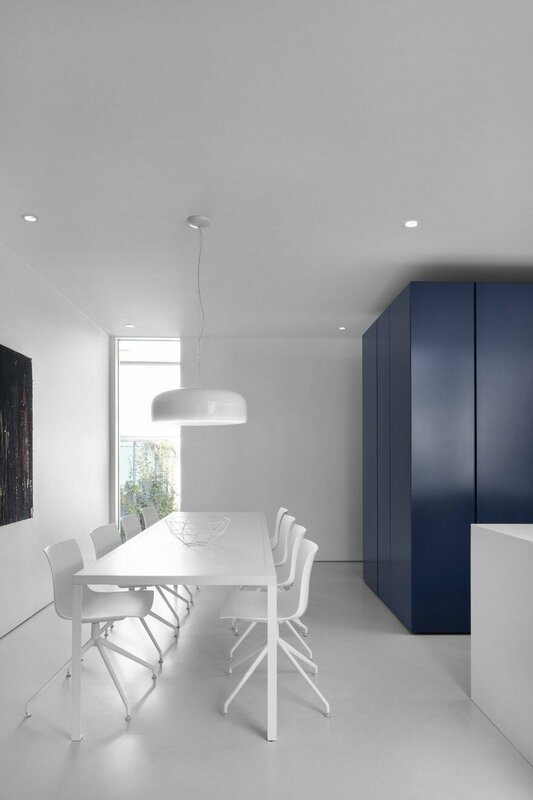 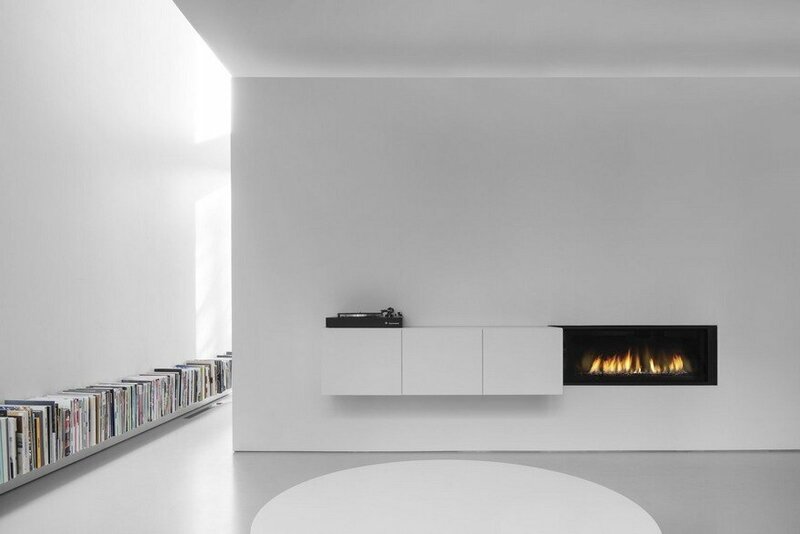 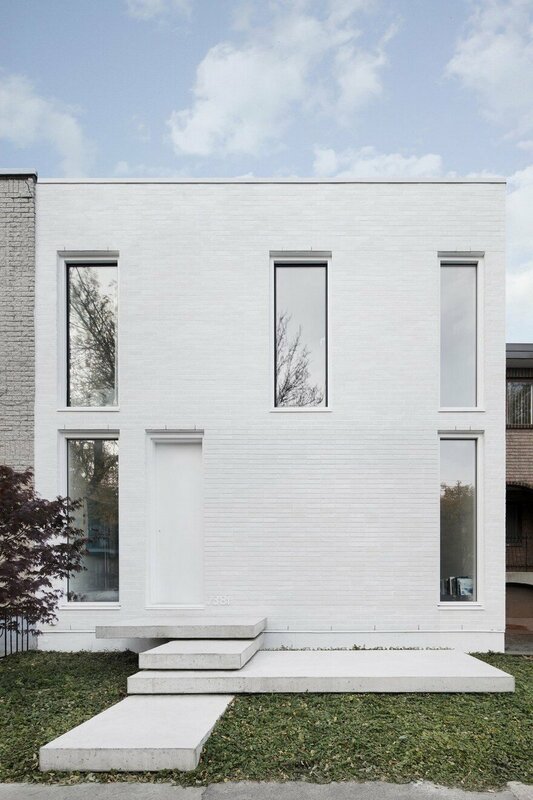 This minimalist contemporary home is a two-storey townhouse of 2,200 square feet, located in Montreal, and proposes a different version of the single-family housing in an urban environment. 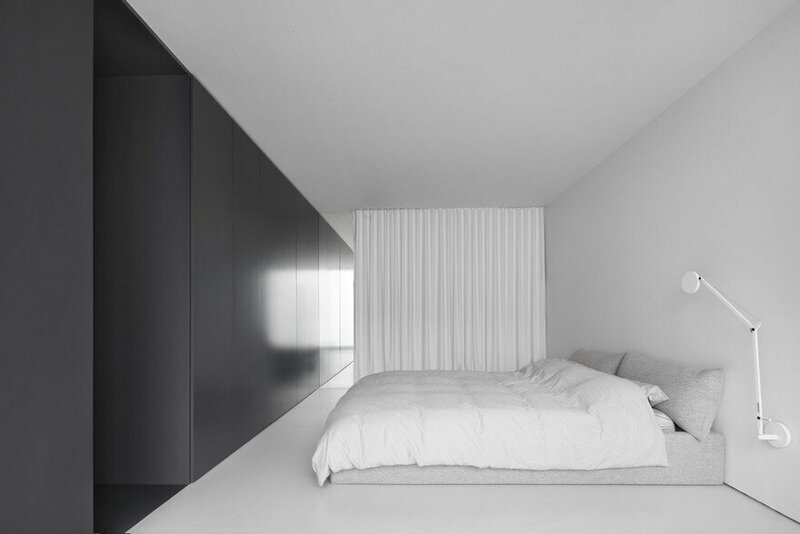 Maximizing privacy, it is folded on itself, even introverted, where everything converges on its centre, a place of tranquility, intimacy and security. 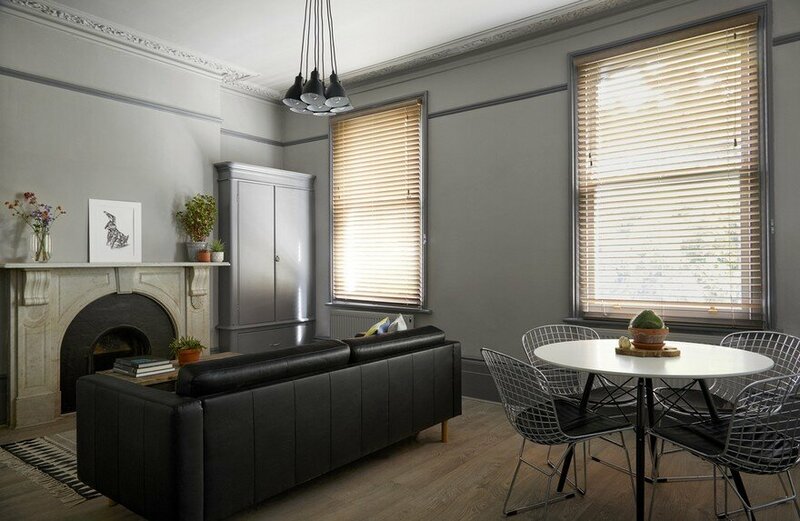 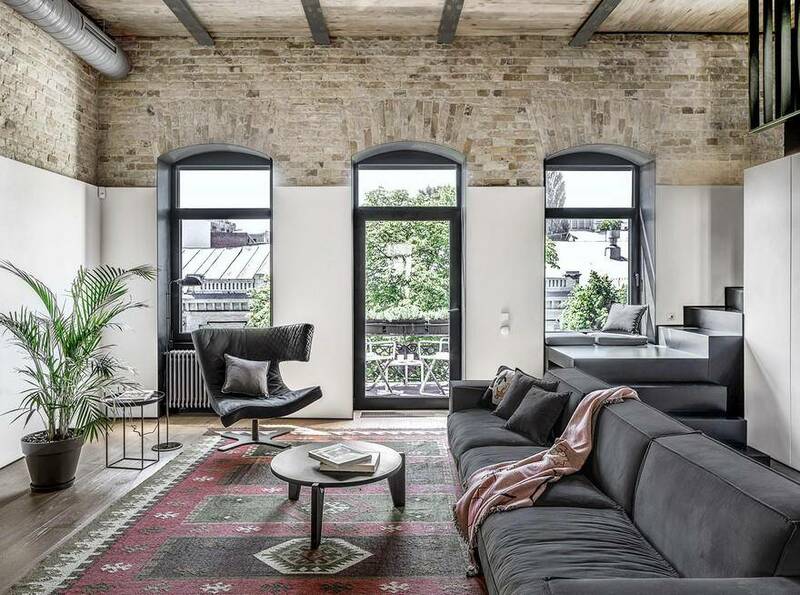 It offers, in return, a humble and simple look at its surroundings, fitting into the urban fabric as a contemporary version of the typical duplex construction of the beginning of the 20th century, reminding several distinctive details of the historical architecture of neighbouring buildings. 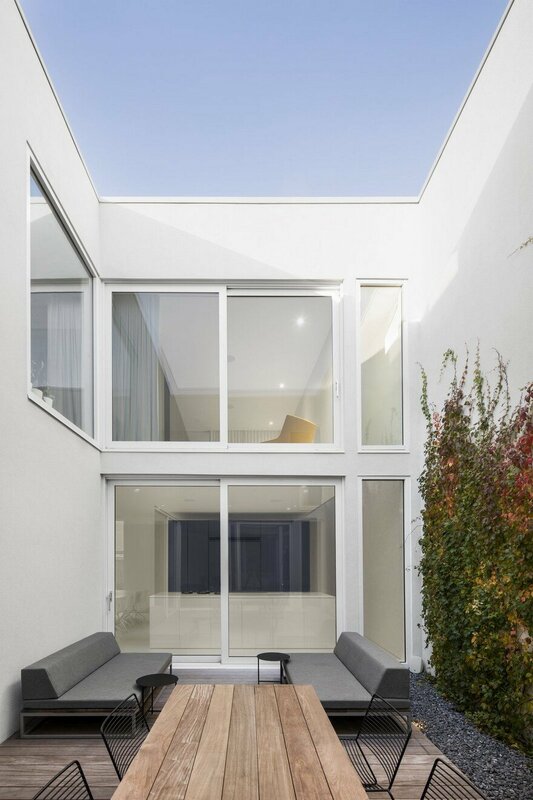 It has been designed around a central courtyard, acting as a huge skylight, capturing natural light at any time of the day and spreading it strategically into the adjacent rooms. 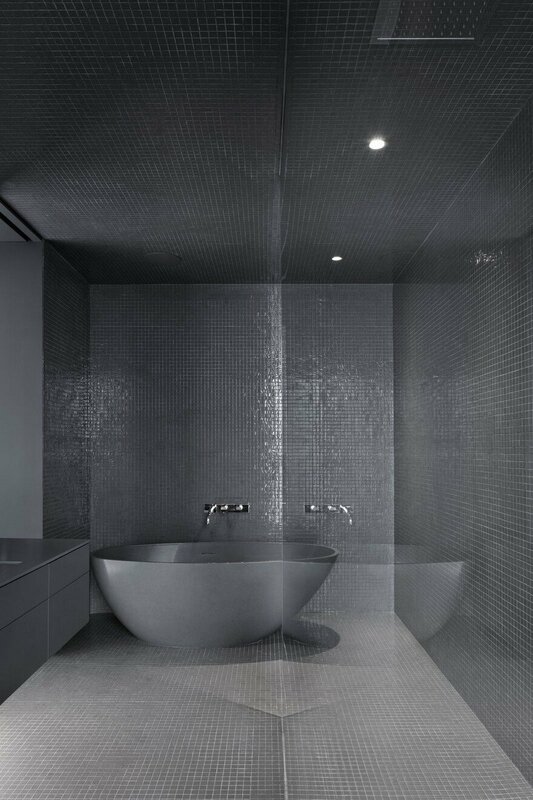 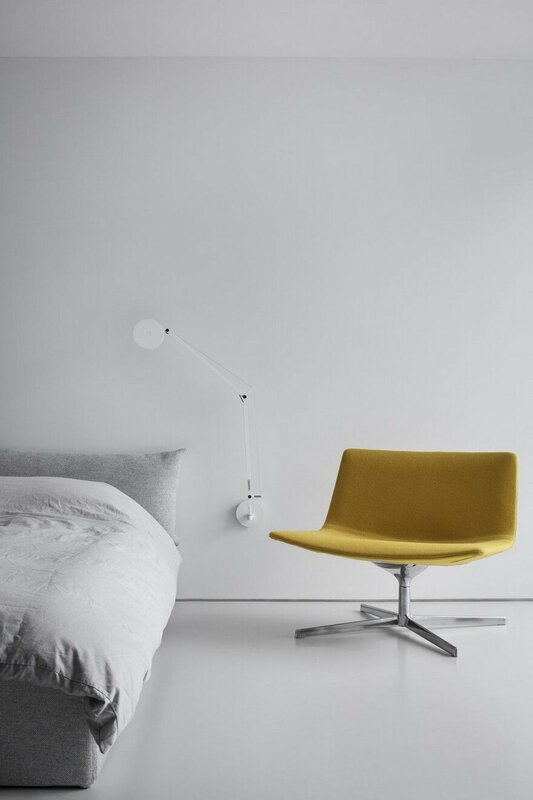 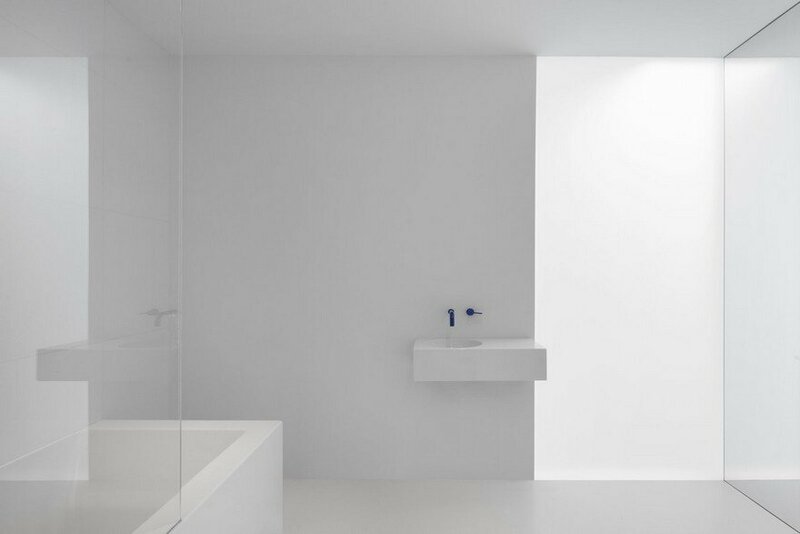 The white colour, omnipresent, acts as a reflective surface and complexifies light effects. 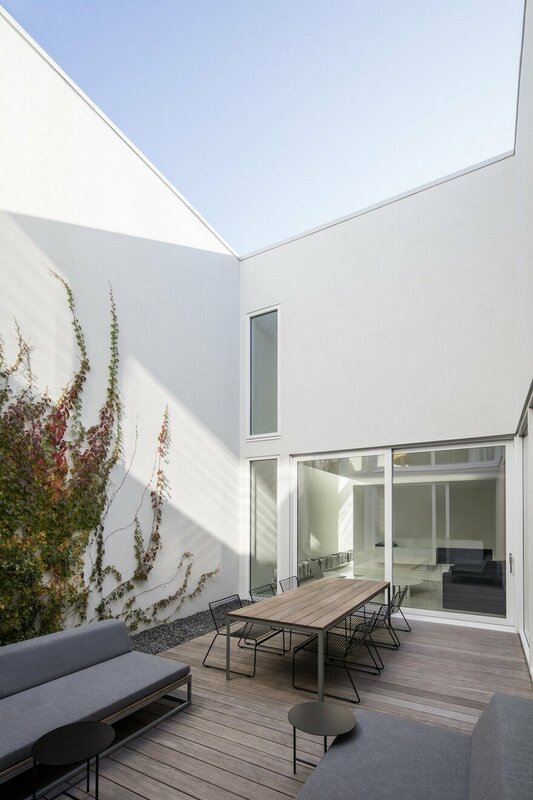 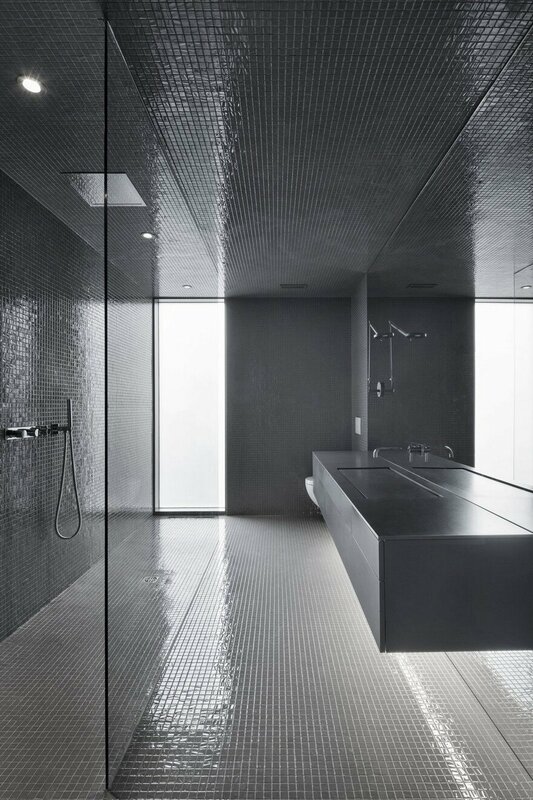 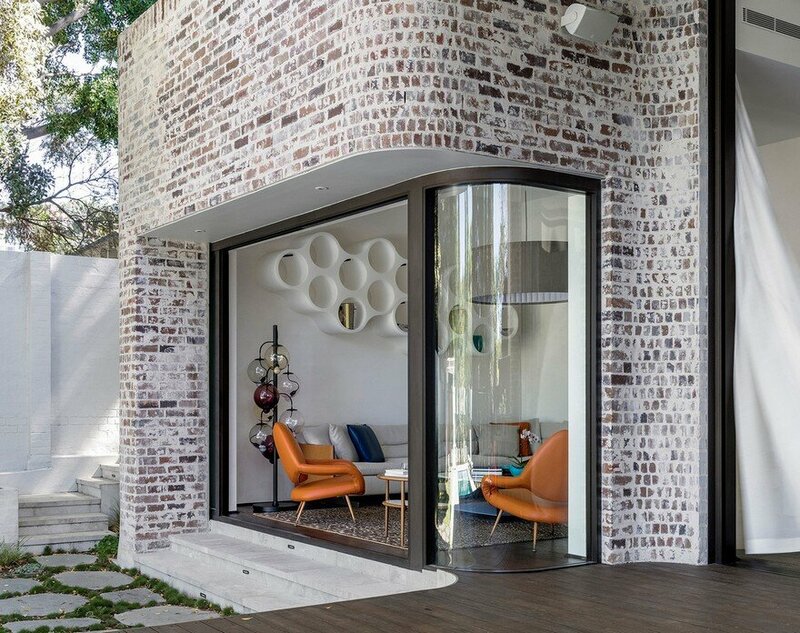 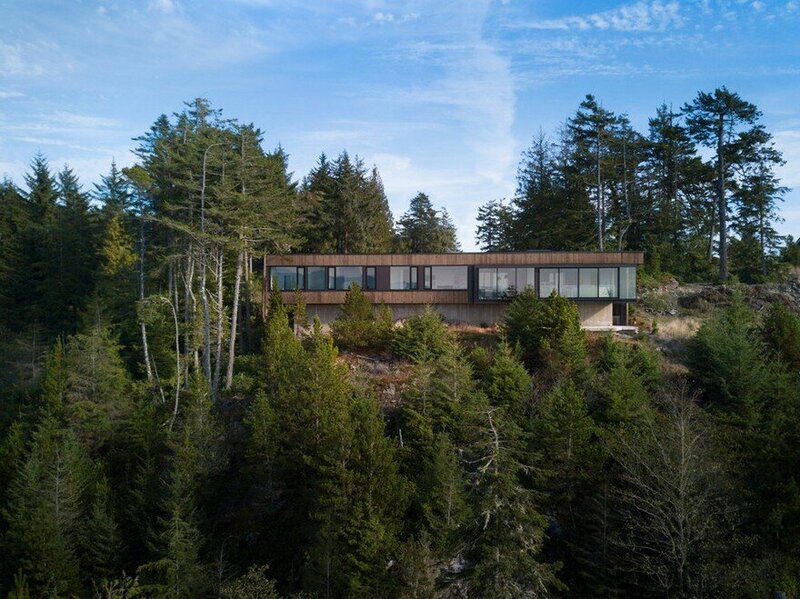 The openings are positioned in such a way as to preserve privacy without compromising the entrance of natural light and the view of the external environment. 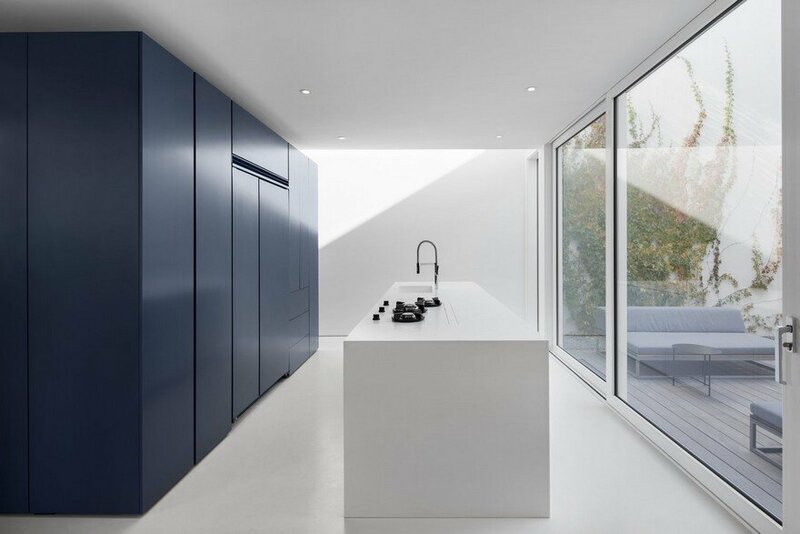 The general layout is a deployment of blocks in space, made of solid materials that are distinguished by their texture, colour or materiality. 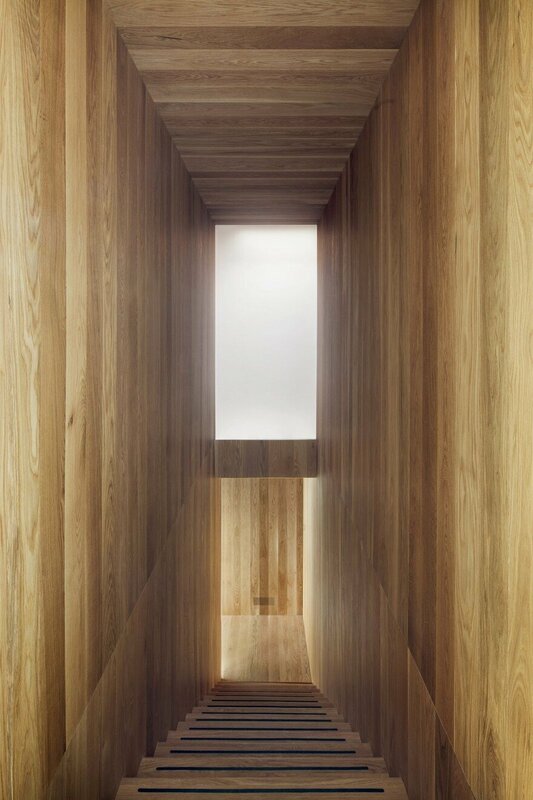 A block of wood is projected vertically on two levels. 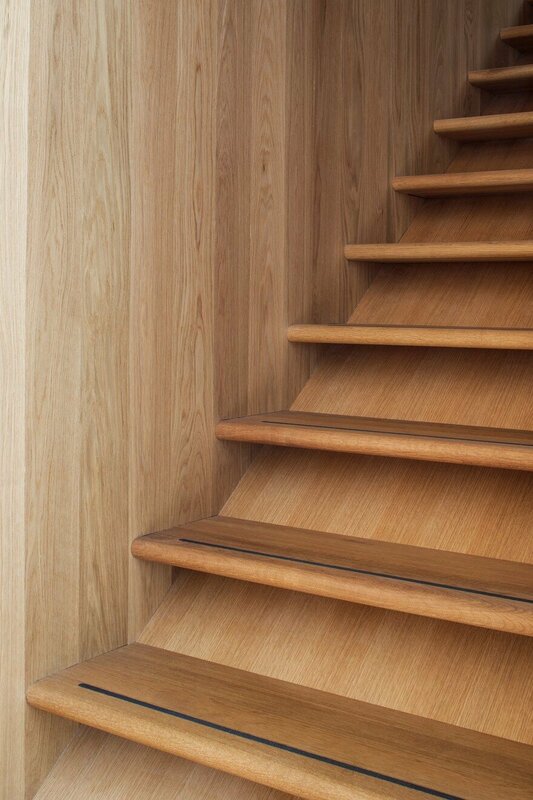 Carved in the centre, a staircase, a powder room and a storage space. 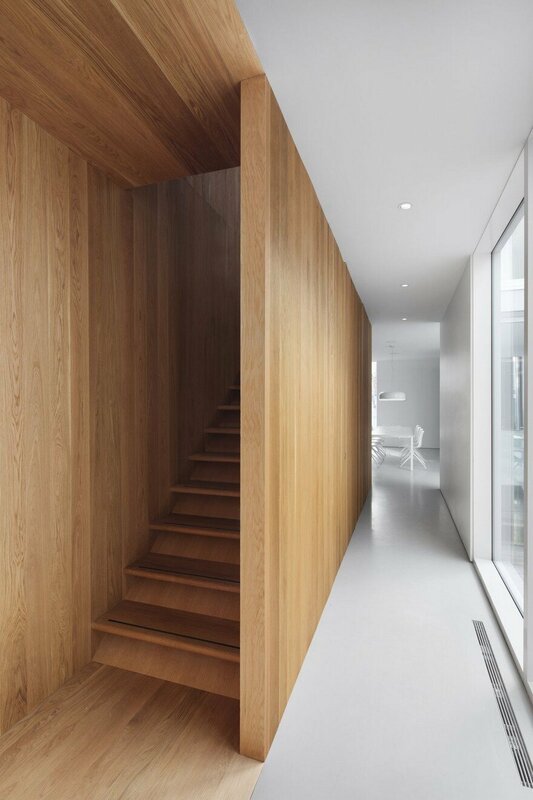 The staircase space, darker, marks a pause at the passage of the two bright levels. 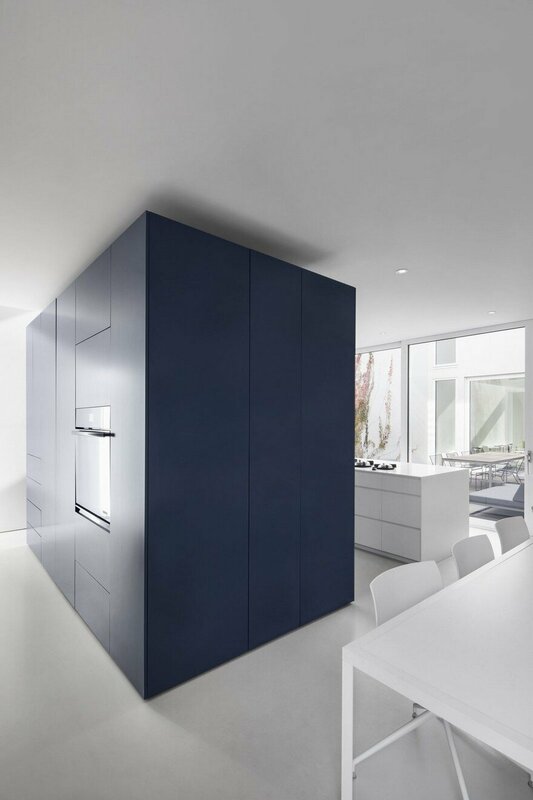 A dark blue block is the central pole of the kitchen area. 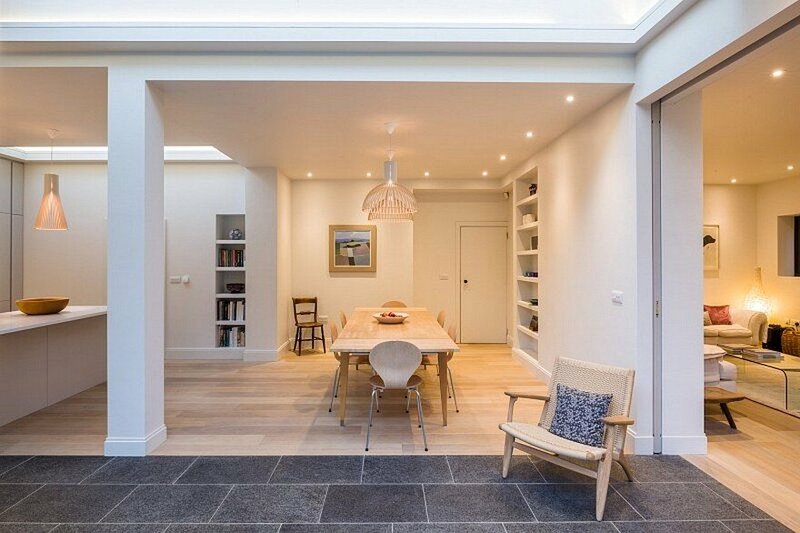 Deposited directly on the floor, its periphery creates a zone of circulation. 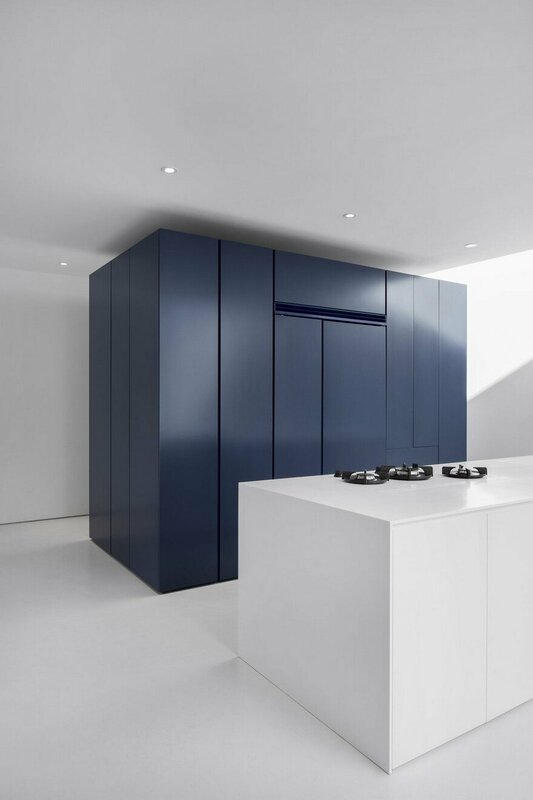 Upstairs, a grey block is composed of wardrobes that circumscribes the main bathroom. 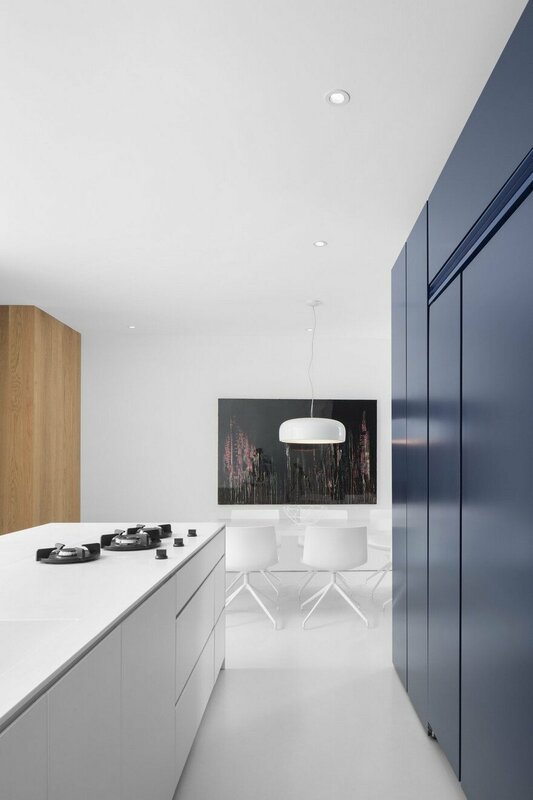 The furniture chosen for the space is sober and subtle in its colours and materials, all in coherence with the conceptual intentions.